Plenty of land. Country living in Katama. Enjoy the wide open space. Family room with table w/ seating for 8, sitting area piano. Family Room - 7 sliding doors provide wonderful breezes. Master Bath with soaking tub. Bedroom 2 - Queen bed with AC, views of beach and horse pastures. Bedroom 4 - Full Size. Known and the Bedroom. 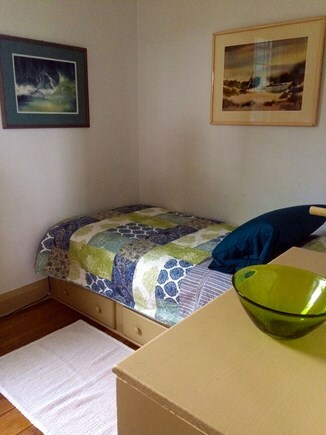 Bedroom 5- Twin Bed, but can also add a cot for friends. Access to Private Beach (South Beach and Edgartown Great Pond). Beds: 2 queens, 1 double, 3 twins, Pullout couch in living room. Katama - Country living with all the amenities. Dog friendly house with private beach. This renovated 1840’s farmhouse is located on Herring Creek Farm. There are 14 houses on the 275-acre gentleman's farm with horses, goats and cows. Enjoy the peace and tranquility of one of the most exclusive locations on the Island. The house has 4+ bedroom / 3 bathrooms and is on 3 private acres with private beach rights to South Beach and Edgartown Great Pond. Downstairs includes an TV room, bedroom/office, formal dining room, large kitchen and open family room (32 x 24) with table with seating for 8. Upstairs has 4 bedrooms and 2 bathrooms. Owner has two horses. Property also has large pasture, out door riding ring and cross country jumping course. The house is on a farm with many animals. We make every effort to ensure that the house is clean, but if you have pet allergies, this may not be the right house for you. 2 Gas insert fireplaces in TV room and formal dining room. Fires are not allowed in the family room fireplace. There is a FHA furnace for the whole house. Air Conditioning by (5) mini split/heat pump (three in the upstairs bedrooms, one in the living room and one in the kitchen). The house has both a cable modem with wireless and DirectTV. There are 2 flat screen TV’s – living room (55”) and master bedroom (27”). Xbox and Kinect system is available. Private Beach – Guests are welcome to use the Farm beach, which includes access to South Beach (on the Atlantic Ocean) and Edgartown Great Pond. South Beach can have rough surf where the pond side is usually calm. We provide a Golf Cart for easy access to the beach and to visit the farm animals. We also provide clamming rakes if guests would like to use them (requires a permit available from Town of Edgartown). Bedrooms (This is an 1840 farmhouse. The upstairs ceilings are lower than in modern houses. If you are taller than 6'2' tall, the ceilings upstairs may present a problem. Please call me if you have questions). Notes: Heat/AC Split - views overlooking horses and ocean. Notes: Heat/AC Split - heat pump. Views overlooking horse pasture. Notes: Known as the closet. Small but everyone wants it. Notes: Renovated 2017 – tub with handheld shower. Stainless Steel appliances. Bosch Dishwasher, Samsung Refrigerator, and new Verona Pro-series 5 burner Gas stove. Kurieg Coffee Maker. 12-bottle wine cooler. Hot/Cold bottled water dispenser. Three separate dining areas. Format dining room with seating for six. Dining Booth in kitchen with seating for 4. Large 8-person table in family room. There is a comfortable living room with TV and fireplace. The family room has a large sitting are with glass doors on two sides that allow for great cross breezes. Additional pricing info: Multiple week rental - deduct $200 per week, State and local taxes of 9.7% will apply.